Lutify.me | How do I apply 3D LUTs in Adobe Photoshop? How do I apply 3D LUTs in Adobe Photoshop? Adobe Photoshop CS6 or higher supports the use of 3D LUTs. If you have a version prior to CS6 consider upgrading to a newer version. Make sure your Layers panel is visible by going to Window > Layers. 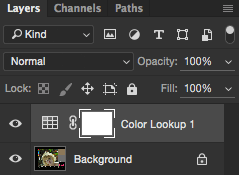 If there’s a check mark next to Layers, go to step 2. If not, click on Layers to make the Layers panel visible. 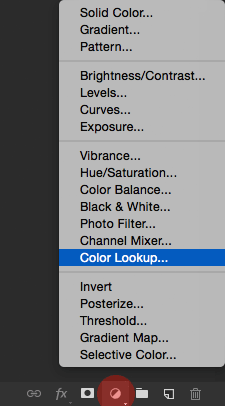 Click on the New Adjustment Layer button and choose Color Lookup. This will create a new Color Lookup adjustment layer that will allow you to apply a 3D LUT to your image. Navigate to your Lutify.me 3D LUTs package folder and choose the appropriate 3D LUT to apply to your image. Should you wish to apply more 3D LUTs, repeat steps 2-4. 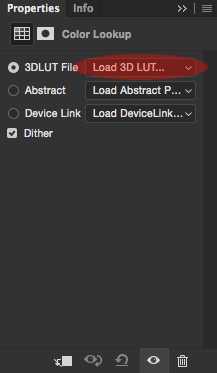 Since 3D LUTs are applied in adjustment layers you can treat them just as any other adjustment layer. This means you can change their blending mode or change their opacity. Please refer to this document to learn how to change Color Lookup adjustment layer opacity or blending mode.